When I was a kid, say five years old or so, I liked picking dandelions. Specifically, I picked them whenever I played soccer on my uncles’ team. They were kind enough to help guide us youngsters to victory – at least, those who had such goals. For I, playing goalie and having zero interest in what was happening around me, happily took to weeding the ground. The ball rolled and the players ran, but I concerned myself only with the dirt and the dandelions before me. I was bored; I wasn’t having fun. That element is key to any sport, any activity: fun. Because if you are not having fun, then what is the point? 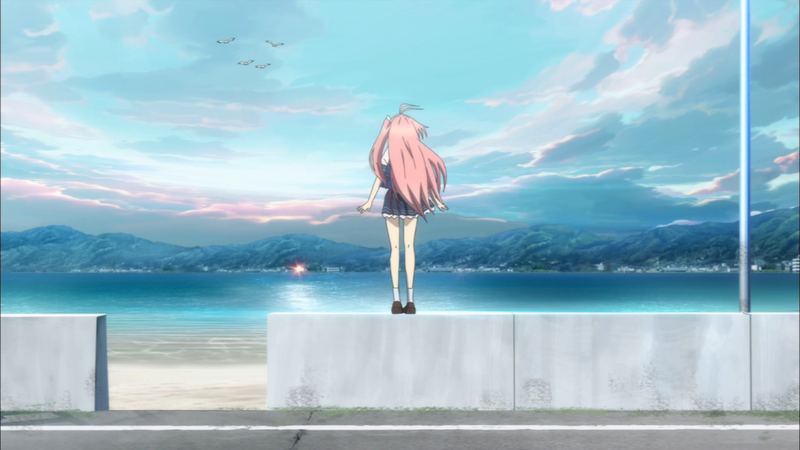 Ao no Kanata no Four Rhythm answers this question, with goals on the ground and dreams in the sky, as a surprising yet slightly subpar anime. Four Rhythm stars Asuka, a girl who has recently moved to the Four Islands Archipelago where people use a new piece of technology: Grav-Shoes. Granting flight, these shoes spawned Flying Circus, a competitive sport that tests one’s endurance, speed, and abilities. After meeting Masaya “Coach” Hinata, Misaki Tobisawa, and Mashiro Arisaka, Asuka enters this new and exciting world that has always been right above her. As such, the anime does a reasonable job of creating, from the ground up (if wordplay is permitted), a brand new, never-before-seen sport. Unfortunately, FC is prone to the biggest problem that the anime has: lack of interest. The cast fly around and create intricate patterns and bring the battle to each other. But most of the time, the drama the sport tries to generate does not stick. One major reason is misplaced satisfaction. Just touching a buoy or swatting at an opponent does not have that feeling of accomplishment because it seems too easy most of the time. Another reason is the lack of urgency. Many times, the duelists ignore certain routes, slowing down the action in an otherwise fast-paced game. And the stakes at hand are just not high enough. Four Rhythm does not give a lot of context in terms of potential accomplishments, tournaments, and end goals. I.e., their efforts do not amount to much. Not that everything feels pointless, but it certainly comes off as not as important as the anime tries to make FC out to be. Altogether, it makes the drama and the sport much less interesting. An unfortunate outcome. Only with FC itself, however. For the narrative holds some power in terms of its themes. More specifically, the show explores a concept that most sports players encounter: fun versus fear. Many people start off playing a particular sport because it is simply fun. Kicking a ball, diving for a catch, or flying in the air with Grav-Shoes unlock a sense of wonder from the get-go. Eventually, some want to take their game, per se, to the next level. They want to compete against other skilled players. But what they find is that some people are far beyond their own capabilities. Try as they may, their skills never match up to that person who is just slightly better. In other words, they cannot win any more. This description starts to get at Four Rhythm’s stance on this theme. Asuka plays FC to have fun and nothing more. Coach and Misaki have fun, believing that they were better than their true skill set. Mashiro derives fun not so much from the game but from hanging out with the group. For these and many of the characters, though, fear takes over. Fear of the unknown direction the game was going. Fear of the opponent they were facing. And fear of themselves, their own thoughts. As the anime depicts, it’s hard to face fear since it takes on these different forms. People sometimes cannot accept change. It’s even harder to admit that there are other people out there that can be stronger. To put it differently, fear makes them think that “losing” becomes the only option. And so fear takes over. Asuka becomes afraid of herself. Misaki fears Asuka. And Mashiro fears being left behind. Fear turns the sport not into a likable experience but rather into a dramatic incident. Yet fear and fun go hand-in-hand. Shindou puts it best: “Because the fear of losing something shows that you enjoy it.” Fear can remove fun, but it can also lead to fun, too. Asuka remembers why she flew to begin with. Misaki realizes that there is more to life than comparing herself to others. 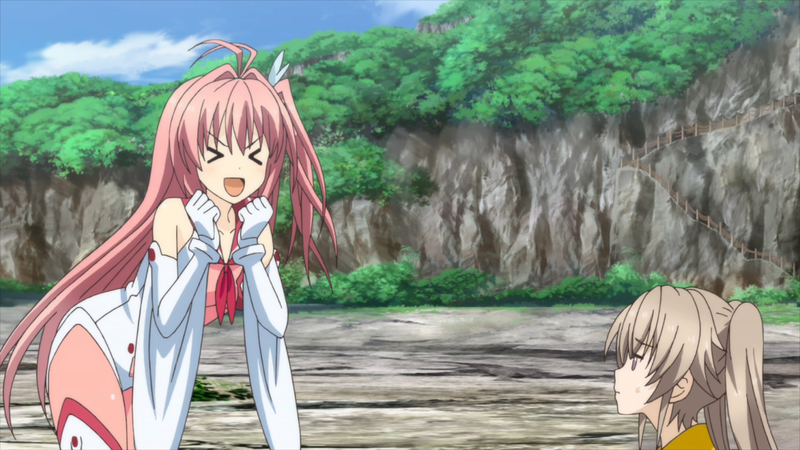 And Mashiro strengthens her person. Indeed, Saki’s entire character – how she uses fear to dominate others in FC – highlights what fear and fun can do to others and for one’s self. Taken together, Four Rhythm creates its take-away message: Winning and losing are not the be-all, end-all goals; having fun takes the crown. Looking at the rest of the anime, it has other highs and lows. The comedy, while not extreme, fits in comfortably among the drama. But the tale itself ends rather abruptly. Regardless, what matters most to the anime is FC and its theme on fear versus fun. The execution on both fronts varies, but the whole narrative is still a passable one. Four Rhythm’s biggest issues lay in its art and animation. First, some positives. The CG work – usually used for small sequences during the battles – does not distract the eye. Also, the later light-shows that the competitors essentially put on are shiny. The anime’s constant use of silly reaction faces also not only improves the comedy but also helps to curtail some of the errors seen in the art itself. Because there are quite a few. Some characters are drawn with incorrect eyes – wrong pupil colors or placed on their faces off-kilter. Specific scenes are reused constantly, like a shot of the announcer or a duelist coming in from the right side of the screen in preparation to cutoff his or her opponent. And while the anime can have beautiful shots of the landscape, it more often than not has the view filled to the brim with blue water and cloudy skies. Granted, it has to be this way since FC takes place over the ocean, but it still does not lead to much detail or creativity. Animation also suffers. Characters can sometimes move around with stiffness, and, worse, missing frames make their actions appear choppy. To be fair once again, the anime reduces the animation to give much of it to the FC battles themselves. But the actual animation nevertheless remains relatively low since, even during battles, the quality can dip from time to time. Even the character designs are not all that impressive, but they are at least stronger than the rest of the art. 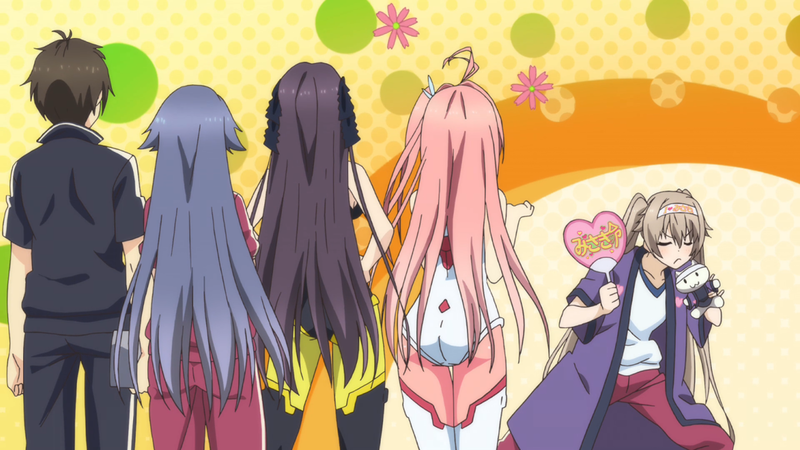 Asuka’s flowing pink hair with special hairclip and Misaki’s bows are the most notable aspects. And while their regular school outfits are bland, their FC attire at least add color and variety. More importantly, they bring about symbolism. Shindou’s purple symbolizes his respectful nature, Saki’s lime green symbolizes her revitalizing path, and so on. The cast of Four Rhythm are an interesting bunch. From the start, it appears as though the anime will follow the harem route. After all, multiple girls with different personalities and types surround Coach, the single male protagonist. Instead, the anime focuses on everyone but him. For a long while, Asuka, Misaki, and Mashiro (as well as many more) earn the majority of the attention. So much so, in fact, that he ends up being not a prominent protagonist but merely a simple side character. But more on Coach later. The true star is Asuka. As the new person in town, she is quite unfamiliar with Grav-Shoes. Her flying evidence enough. She can barely keep herself aloft let alone fly in a straight line. Yet she does not let this obstacle bring her (figuratively and literally) down. Indeed, her extremely positive nature is almost uncanny. She loves to make light of the situation. She is overly cordial even during duels. She smiles when she makes a mistake. She exudes positivity to the point that others cannot help but feel happiness themselves. 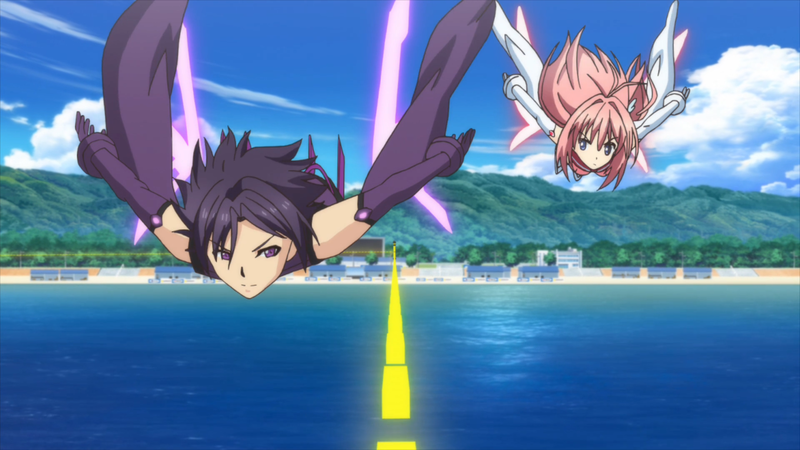 Her stumbling flights last until she performs an Air-Kick Turn, an impossible move for a beginner and especially Asuka. It highlights her inherent strength at the sport, and what strength she shows. Over the course of the season, she moves from the worst of them all to the best in ages – a defined and satisfying arc. Despite her personality, though, it is not all rainbows. As she continually improves and continually finds FC so amazing, she encounters Saki. A fearsome opponent taking the sport by storm with her commanding and intimidating playstyle, she defeats Asuka in resounding fashion. To the point that Asuka questions whether or not she really haschanged from the weak girl that she had always viewed herself as being. Misaki experienced a similar conflict. Definitely not an early bird and a consumer of udon, Misaki is in a normal position at the start of the season. Besides these traits, she is known for her “zip-zap” (as she coins it) FC playstyle and for her doting kouhai Mashiro. She joins the team early on, and, for a time, she is the best. Perhaps obviously, Misaki’s top status does not remain for long. At the first major tournament, she witnesses a lot. Much to her disbelief, she sees Shindou going all-out against Asuka when he did not do the same for her during their match. But when she hears Asuka actually liking the dirty match between Shindou and Saki during the finals, something breaks within her. In essence, Misaki becomes envious of Asuka’s skill, of her happiness. She retreats into herself, avoiding her friends and even FC. Later conversations with Shindou and Coach let her realize her trouble, one that goes along with one of the anime’s main messages: She is afraid. Asuka and Misaki find themselves simultaneously dealing with personal issues, so it is only fitting that they get out of their respective slumps by supporting (and dueling) one another. Both find courage for themselves through each other, leading them down their own paths. That’s another of Four Rhythm’s main messages: following one’s own path. Asuka channels Zephyrion, believing in the power of optimism and fun. Her playstyle reflects her mindset. Misaki tackles her fears much like her zip-zapping tackles her opponents. The same can be seen in nearly every character. Mashiro – technically a side character – gets an entire episode all to herself about feeling left behind around Asuka and Mashiro. Hence, she relentlessly trains, learning more about herself than she ever realized. She adopts a speeder-fighter combo playstyle to fit not only her smaller frame but also to symbolize her adaptable nature. Shindou is usually a calm, respectful leader. But on the FC battlefield, his true self – unsheathed anger – surfaces during particularly difficult bouts. His contrasting characterization accentuates his care and passion to the game. Saki, the ruthless speed-demon, explores the theme the best, however. Because she doesn’t follow her own path. Instead, she obediently follows the commands of Irina, her Second. Saki and Irina tried to replicate Aoi’s (the teacher that advises them) own playstyle to achieve a “perfect” way of competing. But, thanks to the combined efforts of Asuka, Misaki, and everyone else, Saki manages to break away from her self-made birdcage (to use their own ultimate move against them). On top of the characters’ individual growth and thematic presence, the anime layers many parallels between the characters. Asuka and Misaki’s have already been discussed, but there are many more. Misaki admires Shindou for his strength. Rika was Mashiro’s trainer, leading to a close friendship between the two. Aoi happened to be Coach’s coach. The most interesting is that of Asuka and Coach as well as Misaki and Coach. Both remember a “female version of Coach” that they played with and against. In other words, Coach was the first person to give the two girls their wings. Surprisingly, Misaki makes a remark about “who cares” in an almost fourth-wall jab about how Four Rhythm will not be exploring Coach’s character to any degree. Cheeky yet accepted, hearkening back to him never being the focal point to begin with. Nevertheless, Coach is one of the anime’s only missteps with its cast. The show makes a big deal out of his refusal to play FC. As though the major reveal and his (inevitable) resurgence will be groundbreaking (or maybe, given the context, sky-breaking). But his backstory is hastily shown and his not-too-impactful return lacks proper build-up due that aforementioned side-character status he earned from the start. Saki is one of the other missteps. While she does change as a person and does help to explore one of the anime’s themes, her original character has a weak foundation. This weakness is due in part to how late into the season she is introduced. But mostly it’s due to yet more hastily strewn together backstory. In other words, her connection to Irina and the struggles she has been through feel hollow when compared to everyone else. Altogether, while some snags are had, the cast of Four Rhythm are a strong bunch that prove said strength – be it at home or in flight. The opening track for Four Rhythm focuses on a free-spirited feeling to match the free-flying spirits within. The vocal work is okay, but the gentleness of the piece does not help the loftier segments. At the minimum, the initial slow-into-fast singing makes the piece somewhat more fun to listen to, though not by much. The ending track is a definite step up. Various pacing to the lyrics. Up-and-down instrumental work. Multiple singers in harmony. The ED, while not all that memorable, comes together as a mostly happy yet strangely cathartic piece that fits Four Rhythm well. As for the rest of the soundtrack, it tends to lag behind the ED along with the OP. Some acoustic guitar riffs here, a lighthearted clapping tune there. Standard fare. At the minimum, the different sound-effects for FC carry some weight. When the characters shoot past or attempt a tricky maneuver, the anime makes sure to use some cool sounds to give the sport more oomph. Voice acting is clearly better than the OP, ED, and OST. Misato Fukuen as Asuka gives the girl a sweet and happy voice that could brighten anyone’s day. Azumi Asakura as Misaki blends catlike inflections into her words quite smoothly. And Nozomi Yamamoto as Mashiro adds extra energy into the mix with her different upbeat, angry, and overzealous ways of speaking. Back when I first started this one – now about eight months later – I called it an “underdog” in the sense that it had untapped potential. I was somewhat correct. I was pleasantly surprised at how layered the cast members were. The show put a lot of effort into making many different connections between the entire cast, connections that I was not aware were going to be made. It was cool to see it slowly grow not exactly into a complex network but no doubt into a thorough one. I also found myself laughing at bits of the comedy. Asuka’s positive nature, Mashiro’s yuri feelings towards Misaki, and even Aoyagi, Madoka’s brother, had me smiling as he advocated spirit in all parts of life (especially FC). But there were still quite a few people that I did not much care for. Irina, Coach, and Aoi (as well as Shindou and many others) definitely had more to their characters, but I was not too much of a fan of their personalities. Worse still, I found the vast majority of the FC matches boring. 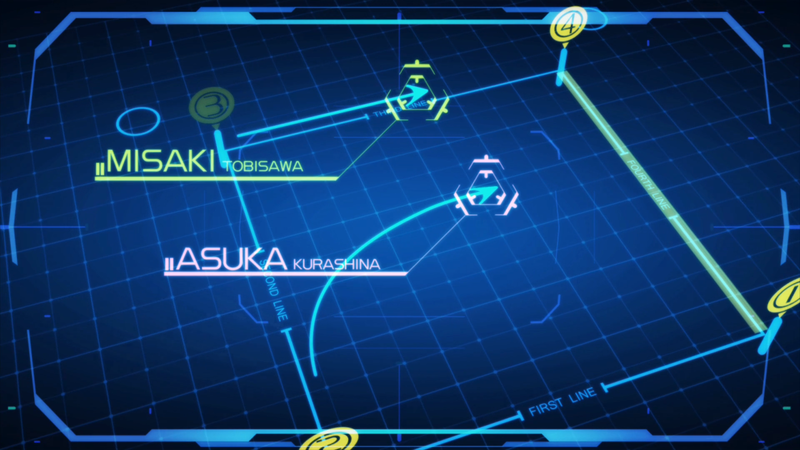 The only one that actually caught my interest was the final one between Asuka and Saki. Many different (and new) moves were used, the battle meant a lot to both sides, and the final light spectacle was pretty pretty. While the others before had minute moments of intrigue, they were largely forgettable. And given that FC was such a major part of the anime, the total amount of entertainment I got out of this one never really took off. 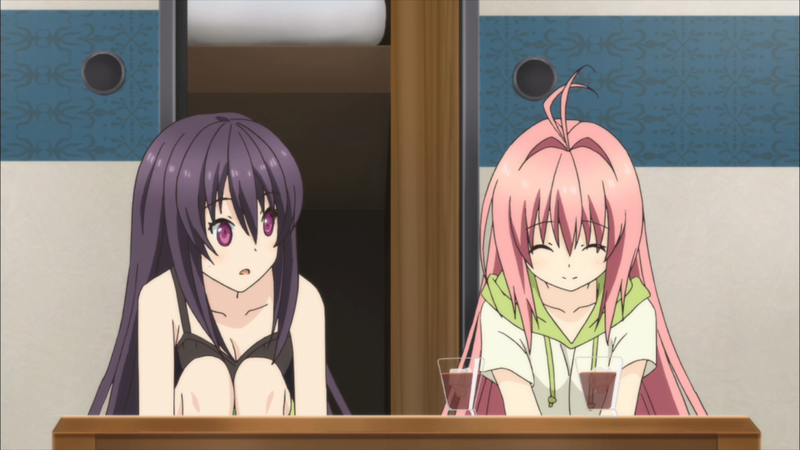 Ao no Kanata no Four Rhythm is all over the place when it comes to execution. On the one hand, the music and especially the art have troubles. On the other hand, the story’s thematic focus and the parallels between the characters make each strong in their own right. Overall, the anime flies higher than a dandelion in the dirt, but that is not really saying all that much.